There's no need to be in over your head about options for a new roof. Today's roof may appear comparable to those of a few decades ago, but that's where the similarities stop. Modern materials have been coordinated with ventilation and installation for more effective systems. Homeowners can expect modern roofing to last longer and look better, said Mark East of Economic Roofing in Baltimore, a roof installation affiliate of The Home Service Store. The standard roof surface -- shingles -- has changed vastly from the days of curling, pebble-shedding paper matt shingles. 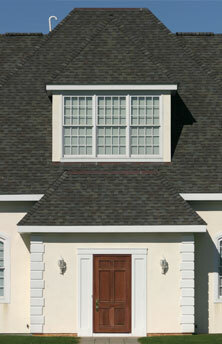 Fiberglass shingles introduced in the late 1980s resist warping and come in a variety of weights and designer colors. Shingles are also manufactured for different geographic conditions, climate, hail-resistance and winds to 110 miles per hour. Shingles are rated and warranted by weight. Inexpensive shingles weigh 205 pounds per 10-foot square, while heavyweight shingles are 425 pounds per square. The better the shingle, the longer the warranty. Standard warranties are 20 years to 50 years. Architectural grade shingles can be warranted for a lifetime. Still, East says, sun, water, accumulated debris and attic heat and humidity eventually take a toll on the best of shingles. Just because a shingle doesn't warp doesnt mean it is without problems. "Its hard to see wear on fiberglass-based shingles, especially when you inspect the roof as you walk around the house," says East. Only a close inspection will reveal cracks that are telltale signs a new roof is needed. The cracks may cause water damage to the subsurface. Visibly damaged shingles arent the only measure of when a roof needs replacing. East suggests homeowners pay periodic attention to their roof, inside and out. Look for damp spots in plywood or particleboard and moisture around attic pipes and vents. A Home Service Store manager cautions that there is more to roof replacement than slapping on new shingles. Bill Petitta says the best approach integrates the right shingles and installation procedures for your area and adequate ventilation. Adequate ventilation is often overlooked. Today's emphasis on energy-tight homes has one side effect: less air movement traps heat and humidity, and might cause shingles and substructure to wear out from below. Install fans or combine ridge vents with louvered soffitts. Picking the right contractor is important to a new roof, too. Find installers who specialize in roof systems and are willing to install to manufacturer specifications for your climate and region of the country. Experienced roofing contractors will have their insurance company forward proof of liability and workman's compensation coverage. Do not accept photocopies of policies. Petitta also urges homeowners to pay only when the job is completed to their satisfaction.